When do girls start doubting who they are and start believing the words of others? It’s how it should be. Innocence, sincerity, simple. I watch my daughter and her friend do each other’s hair. They are 8 and 9 years old. They haven’t discovered that this classic game of “salon” is a primer for beauty. To them, it’s just two girls doing each other’s hair. It’s just what girls do at a sleepover. There’s no competition, no judgment, no jealousy. I listen to them giggle. They squabble at times, but it always gets resolved. Instead of soaking in every minute of this, I find myself thinking about my work as a counselor. Imagining their life in five years. Picturing them sitting in my office, hiding. Terrified to go out in the hallway and face their peers. Feeling alone and embarrassed, they blame themselves. They look to me to make it better. Pleading with me to give them the words to help them face it—face the cruel world our teenage girls live in. I leave that world for a minute. The one in which girls are left to always wonder where they stand, constantly questioning who is on their side. The one in which they spend most of their time looking behind themselves rather than in front. The world that scares them, but doesn’t let them talk about being afraid. I come back to the world that’s in front of me. The one that shows the opposite. No fear, no insecurities. These girls aren’t wondering where they stand with each other. They are safe to share their feelings. There are no repercussions to their honesty. No worrying that what they say will end up out there for others to see. They trust each other. They have no reason not to. They still admire and compliment each other. I watch them lift each other up, rather than tear each other down. They don’t yet know about Snapchat or Instagram. They don’t retweet pictures or share Facebook posts that are intended to cause harm. They don’t know about sexting. “Backstabbing” is still a word they would ask for the definition of. It’s not part of their vocabulary. They have yet to experience the fallout from their reputation being ruined at the stroke of a key. They don’t know about cutting their skin to feel something other than the pain they already have. They don’t know about suicide. Thoughts of despair, desperation, and hopelessness have yet to invade their minds. They still believe their body belongs to them and only them. They opt in because doubt is not the first thing they think about. They believe in themselves. Their place in this world is still defined by them. They are confident in their abilities. They know how to say NO and set boundaries. Their value and belief in who they are still empowers them to ask for what they need. They have a voice. They still feel free to use it. Their mantra is: I am a girl. I am smart and strong. I can do anything. When I am working with teenage girls, I often find myself picturing my daughter. My work has become more personal. I look at these girls who have sat across from me for 15 years, and can’t help but think of them as my own. There are many days when I work relentlessly to get them to see their beauty, their worth. I sit knee-to-knee with them, hoping they will see what I see when I look at them. They are our students, daughters, sisters, and nieces. They are perfect in so many ways. They feel imperfect in so many ways. Part of me wonders where they learn this. When do they start doubting who they are and start believing the words of others? On those days when I am feeling discouraged, I look at them and extend my hand. Tell them that I don’t have the answer. Sometimes we just sit there, both of us knowing that there is nothing we can do to change the outcome. The damage has already been done. It is in those moments that they have to start believing in themselves again. Remember what it was like to be an 8-year-old girl brushing her friend’s hair. Feel the security that came as a result of simple friendships. Trust that there are still relationships that can be like that. Believe that they are enough. Tell themselves that they are worthy, valuable, beautiful, able, and incredible. Tonight while I write this, I hear them in the next room. 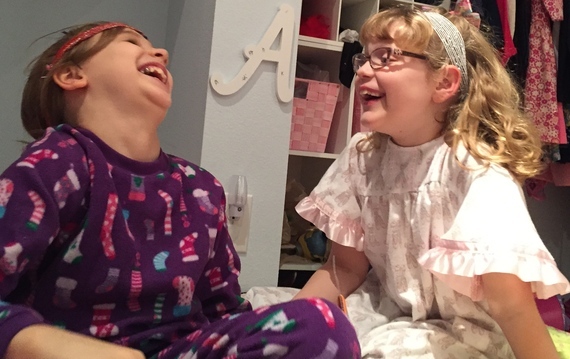 My daughter and her friend giggling. Whispering secrets so that I don’t hear them. I sneak over and look through the small crack in the doorway. Huddled under the mound of blankets, they are free. Free to speak their minds. Safe from judgment, lies, and cruelty. I see the faint sign of light. They have a flashlight with them. The silhouette of a diary is obvious through the covers. They are writing in it. Their words speak of a world in which girls are strong, kind, able, enough, confident, and happy. What I read restores my faith in the world that our girls grow up in. We CAN help them make it different. I’m not sure if the words I read are from that night, but I copy them down anyway. They are simple. They need to be shared. I know exactly who needs to see them. Read them, I tell her. This girl who sits across from me, who has lost who she is. “I am a girl. I am silly, smart, good at ballet and the monkey bars, and a good friend. I have a kind smile. I like myself,” she reads. There it is, I tell myself. Hope.